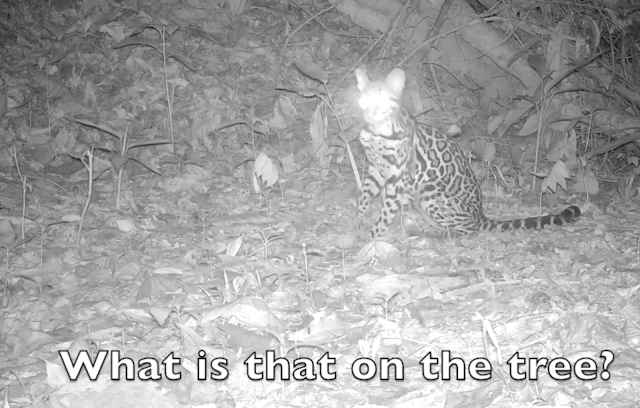 Cute boy Ocelot ditches Mom...hangs out...catches snake...plays with camera... is scolded by Monkeys... Brings a friend by to show off! The entire video is down below. The Complete Video of this Story is Down Below! "Ok Mom....I'll see you in a few hours.....no ma'm....I'll be fine...yes, I'll wait right here for you!" The chubby young ocelot told his mom. She left.... he sat there. He licked his paw and cleaned his face. "What are those blinking lights on that tree?" 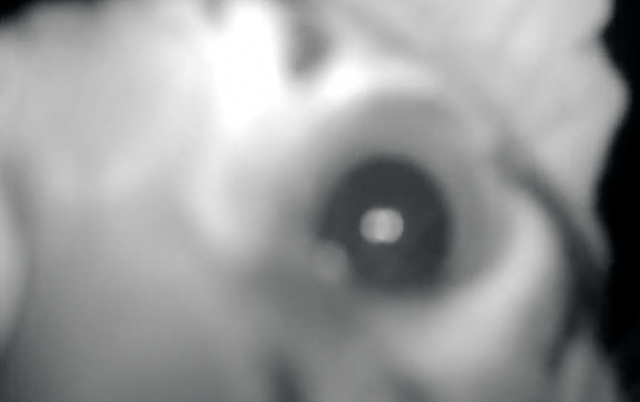 Eyes spies a Camera Trap! "Oh...never mind...I'm hungry maybe I'll have a snack. A snake snack sounds great!" "Cool, I caught a snake!" What are those strange blinking lights...I'll lick them...no...I'll bite and twist them. But around 3 the next day he returned and visited with the cameras as endangered squirrel monkeys screamed at him overhead. The humans walked by that night and noticed the twisted camera. Frank, James, and Owen walk by that night! Later that same night, he shows back up and plays in front of the camera with his friend! Here is the full video! If you can click the "Watch on You Tube" button for a bigger picture. Those of you that wish to support our efforts can do so in several ways. You can always send us a contribution via snail mail or though PAYPAL. Sooooo…..if you could subscribe to our channel and share our videos it would be great! Here is a handy button. It is that easy! I had this blog written and ready to publish last week, then we got some really exciting news. We identified one of the rarest mammals in Costa Rica on one of our cameras! How rare? We are likely one of about five sightings. 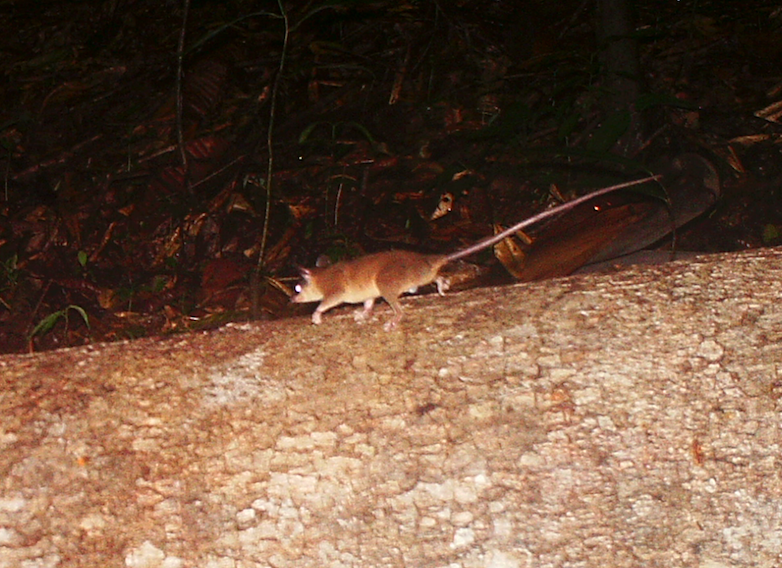 This may be the lowest recorded sighting of the arboreal Rufous Tree Rat at less than 2 meters above ground. Short ears and black tail are just a few of the distinguishing characteristics of Diplomys labilis. When I could not find the above rat in my field guide, I recalled that an arboreal rat had recently been discovered living in Costa Rica…I looked into a Tico Times story about Costa Rica's 250 mammal species . The Rufous Tree Rat was only discovered to be in Costa Rica in June of 2015. 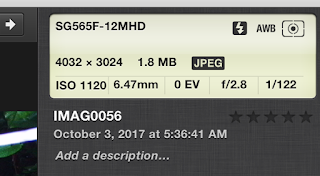 I sent images via email to the researcher mentioned, José Ramírez, with images of our buddy. Late Friday afternoon he confirmed, with 90% certainty and 100% enthusiasm, that it is indeed the Rufous Tree Rat. Here is his description of the finding Here is his description of the finding. The other new visitor is none other than the wily Coyote. 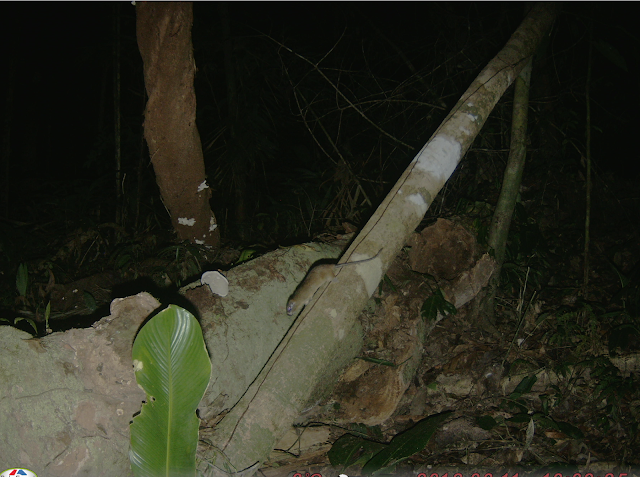 Despite having 15 camera traps throughout the forest it never appeared on any cameras. I just happened to see it run past one of the cabins so I set up a camera and it was a nearly a daily visitor. We also found some droppings and realized that it was probably feeding on iguanas or basilisk lizards. Jaguars, Pumas, and man are the coyotes only known predators in Costa Rica. One critter that we have suspected of being here is the Mexican Mouse Opossum. Well we finally got a good enough image to properly identify it. They are some of the smallest marsupials in the New World. The other rare mammal that we saw was the Greater Grison. These small mustelids (Weasel Family) run around the forest and are rarely seen by people. 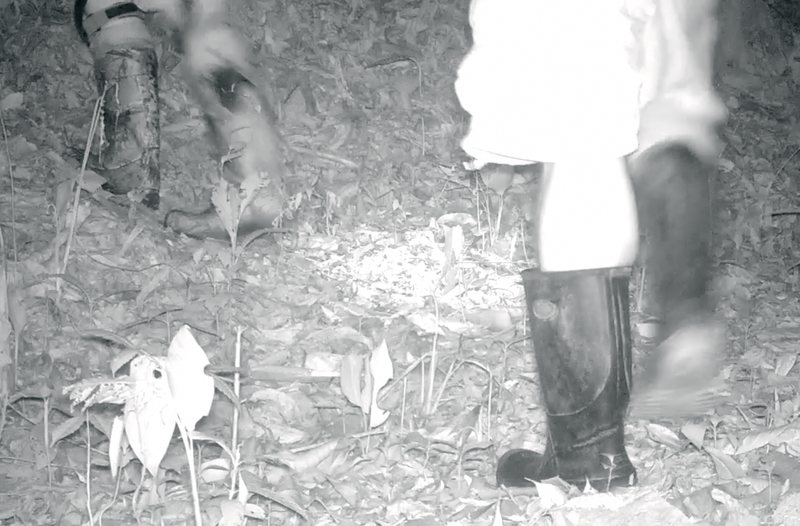 We are catching more of them on camera traps. We were fortunate to have a short video and a nice clear picture of one. 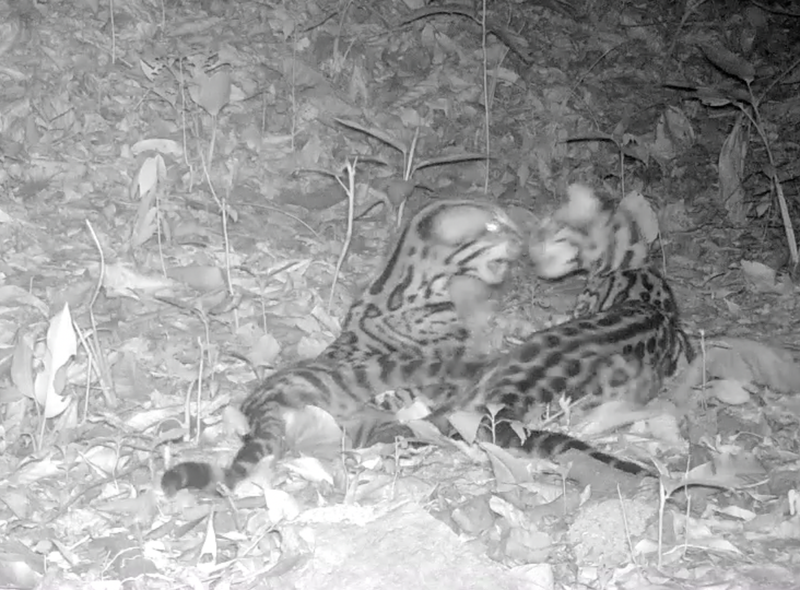 It has also been a few years since we have captured good images/video of an Ocelot and her cub. From October through our last visit in March, we saw them on a regular basis in all parts of the forest. I compiled a short clip of their wanderings. The young ocelot caught perhaps her first mouse! When we started this project years ago, Aida told us that it was not uncommon to see naked people out in the woods. Sure enough, we got several video clips of an amorous encounter of this gentleman and his lady friend! 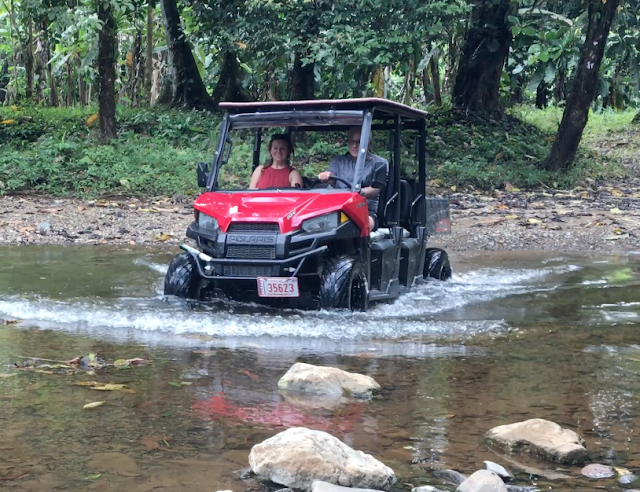 Eleanor and Jimmy cross the river after we set two cameras in a remote location. 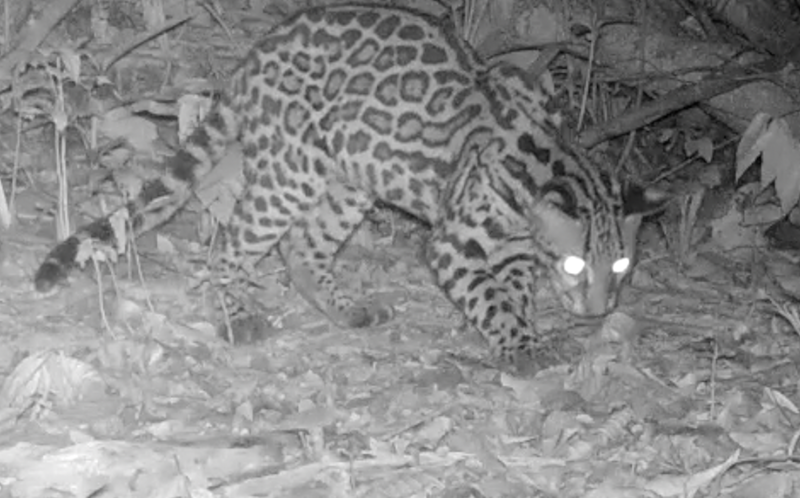 We teamed up with Osa Conservation for the largest Camera Trap project in Central America. 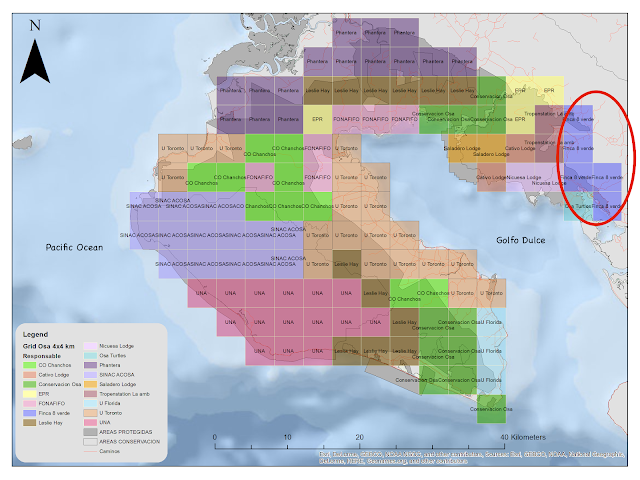 They created a grid with 120 squares(240 cameras, 1,920 AA batteries) over the Osa Region of the Golfo Dulce. Each Square has two opposing cameras. The study will run for 90 days. Finca Green Eight(Ocho Verde) represented by the purple squares in the red oval. The data collected will assess the health of the endangered Jaguar population, their prey, and their activity in vital corridors throughout the regions of Costa Rica. We (OchoVerde) were responsible for 5 squares(10 cameras). Exciting news will be coming from this research over the coming months. Here is the link about what we’ve done so far .Click here to learn more about this amazing project. Our five wireless cameras continue to send us email images from over 3000 miles away. 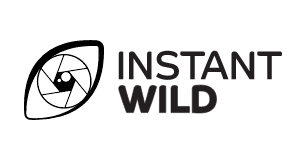 Of course, you can follow along on the Zoological Society of London's Instant Wild Page. 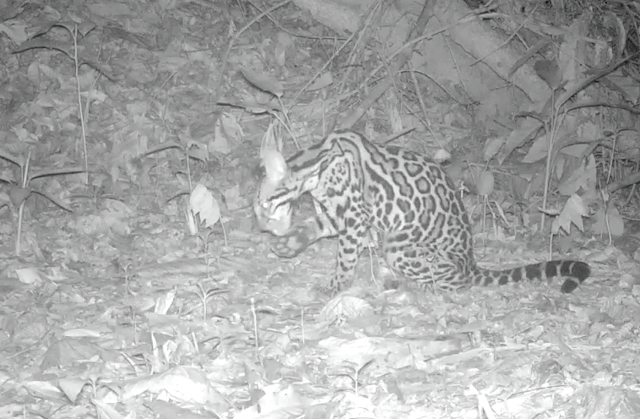 Or better yet, sponsor your own wireless camera in Costa Rica and get these remarkable animals send directly to you. EMAIL ME if you would like to do this! 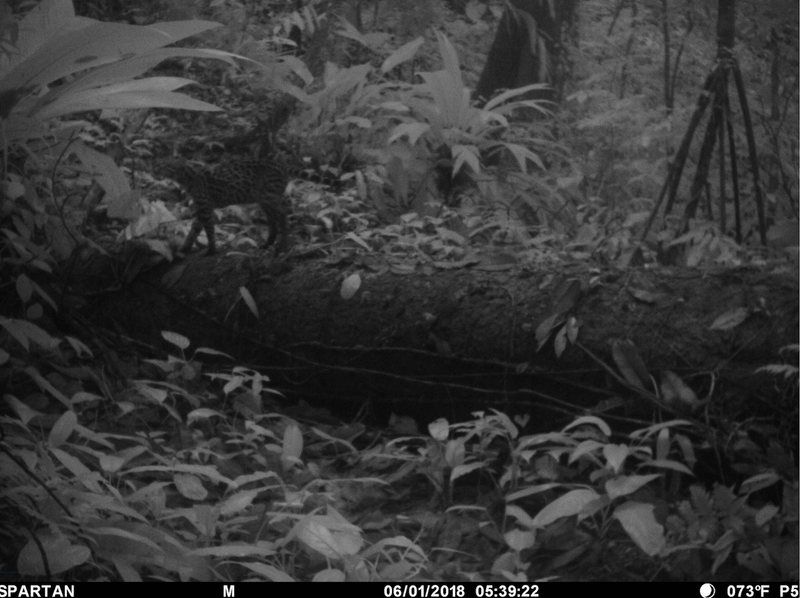 We have also been working with Osa Conservation for almost two years to get wireless cameras working out in the Osa Peninsula near Corcovado National park. They finally received a wireless network out there. I was apparently able to crack the code in order to get their network up and running. We had some great help from a new wireless camera company called Barn Owl. It seems as if it is only matter of time before we get images of a Jaguar! Capuchin Monkey and an ancient sphere. We were presented with an opportunity to visit a site literally right down the road from Ocho Verde where several of these spheres are located. We placed a wireless camera on the property and mysteriously the 12 new lithium batteries died before one photo could be taken. I eventually moved it to another spot where it seems to be functioning. 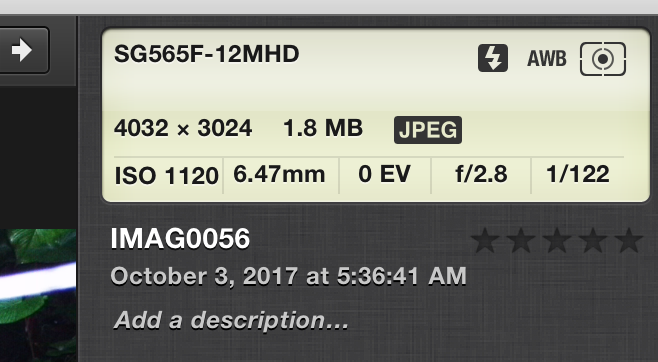 It is sending about 60% of its pictures. I put one of our trusty white flash cameras down by the creek and got some outstanding images. What in the hell is it? Our cameras take great pictures, but sometimes we just cannot figure out exactly what is going on. We have two cases that we would like to share here. The first is this strange apparent beam of light shooting across the frame. It could be an insect, but at 5:36 am it is pretty dark at this place. Shutter speed is 1/122 of a second. Whatever it is seems to be traveling very fast. The second mystery image involved what I think is a rather large animal. 1:20am in the center right of frame. I would certainly say that it is dog sized, but I cannot figure out how or why it has those parallel lines running across its body and legs. I would guess camera malfunction, but they appear to be behind the leaves as well. If you have a guess on that these are, please email me or leave a comment below. Thanks. Hognose Skunk on the trail of a mate. 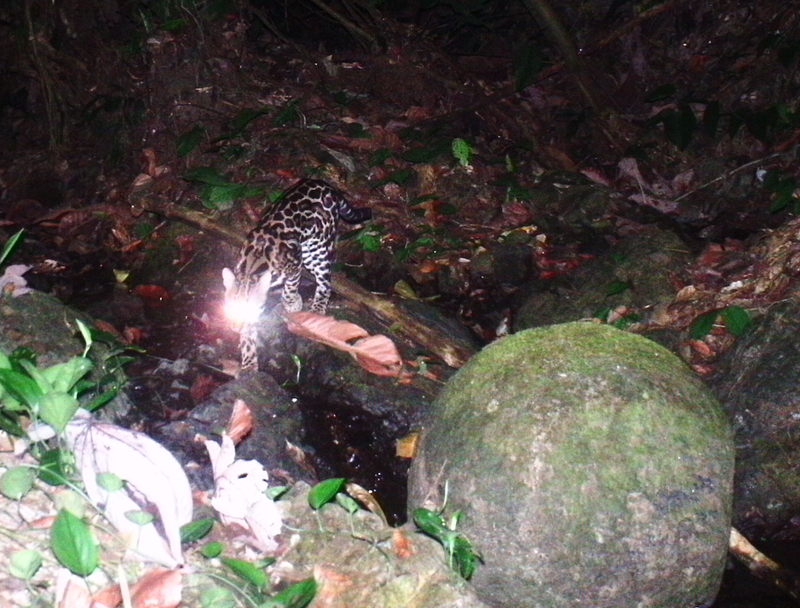 Ocelot on Log via the wireless camera. In the one that got away category...It would have been a beautiful Jaguarundi shot! You can always support us by subscribing, watching, and sharing our videos on YouTube. For evry thousand vies, we get a few pennies and this does add up over the years.